Historical homes are a beautiful. They are a piece of our history and offer a look into the past. Victorian style homes have become special and cherished structures in many towns scattered across the country. These homes are gorgeous, stylish, and unique compared to the modern look of current houses, but they also need a lot of maintenance and restoration knowledge that owners must understand. These old homes require more care than modern homes and often require large renovations to ensure that the home is safe to live in. The tricky part about restoring a historic home is that generally people want to keep is as historical as possible. They want to preserve the unique woodwork, the stylish fireplace, and the intricate detailing that decorates the home. And that can be a tough job when the house needs some serious work. If you are in the process of restoring a Victorian home in the Des Moines area, you can worry about one less restoration process—the paint. At JC Toland Painting, we are proud to be experts and knowledgeable in historical house painting. We understand that this is not a job to be taken lightly. Painting a home with such great detail and history is challenging, requires experienced hands and unique tools, and end can even be a safety hazard. We know how to make a historic home look as good as new. A fresh coat of paint can transform a Victorian home, but it must be done right. While we take care of the paint job for you, make sure you know some important things about restoring your historical home. Your home is old, so be prepared for it to have its issues and not be designed quite like a modern day home. The floors may be uneven and creak with every step. The doors may get jammed more often than you’d like. They heating and cooling with most likely not be as high-tech as in current homes, so be prepared for uneven temperatures in rooms. Preserving what is left of this historical home is important to keeping its history, so while that may mean you have to work harder to start the fire, open a window, or constantly deal with a draft, it is worth it. If you love the Victorian look you will have to put in extra effort to keep it in tip-top shape. If you have recently invested in a Victorian home be prepared for major renovations. But remember not everything has to be fixed. Restoring an older home can get costly, so a smart decision is to only make the necessary renovations to start. Before you add new flooring to your home, be sure to make the more important renovations first. Check for damages in the home that need to be fixed. Roof problems, water damage, cracks in windows and doors, or any other problems that could lead to something more serious down the road. Take care of these issues first—before you start redesigning the bathrooms. The sooner your fix issues that could be costing you more money down the road, the sooner you can start saving and have one less thing to worry about. And once these problems are taken care of, you can start adding the aesthetic touches you want. Not only should you hit the important issues first, but you should also not worry about the quirks of the home. If cabinets or hallway closets have old and weathered doors, rather than replacing them, just give them a fresh coat and keep their old and worn look, it adds style and in not a necessity in the renovation process, allowing you to save some money and preserve some of the home’s original features. Maybe the floorboards are no longer straight and smooth—with bumps, edges, and uneven board the floor may seem like a necessary change. But you can live with uneven floors, at least for a while. They may even add more character to your home. Don’t rush to fix everything and truly consider what need to be fixed right away and what can wait. 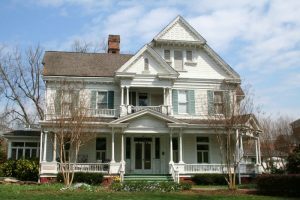 Restoring a historical home can be a very difficult process, and if you have no experience in renovating homes, let alone Victorian homes, you will want to find an expert to help, or at least tell you what truly needs to be done. Don’t just seek out any contractor or inspector, make sure the have knowledge about historical homes and buildings and understand what needs to be considered when beginning the process. These experts can help you to not make mistakes and make problems worse than they already are. You want to find someone who understands that you are trying to preserve as much of the home as possible and not remodel it. Like we mentioned before, JC Toland Painting is knowledgeable in historical painting. We understand the techniques, have the tools, and are very careful when dealing with a Victorian home. Victorian homes often have remains of paint that contain lead, making the job of removing the paint potentially dangerous. We take many safety precautions to ensure that we rid your home of lead paint safely. Your historical home will look as good as new with a fresh coat of interior and exterior paint. There are many factors you want to consider when getting your Victorian home painted. Think about the color, the style, and what you want your home to represent. Do you want it to match the colors commonly used in the era it was built? Or do you want to select you own colors and not worry about the historical paint colors? Victorian houses were painted certain colors for different reasons. For example, the ceiling of porches were often painted sky blue out of fear. People believed that painting it sky blue would trick spiders and hornets from nesting there. Making a decision on your historical home paint color can follow beliefs like this or ditch the history all together. In a future blog we will discuss popular historical painting colors and styles. But whatever paint color you choose, be sure to let JC Toland Painting help with your historical home painting project! We are experts and understand the challenges that come with historical homes, and we can help you restore and preserve the history of your home! Fill out the form to get a free estimate today and contact us with any questions you may have! 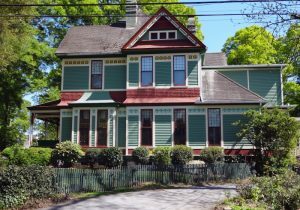 JC Toland can help you transform your Victorian home into something that is gorgeous, unique, and special to the history of the town.